I had seen Helen Cox at Resolution! 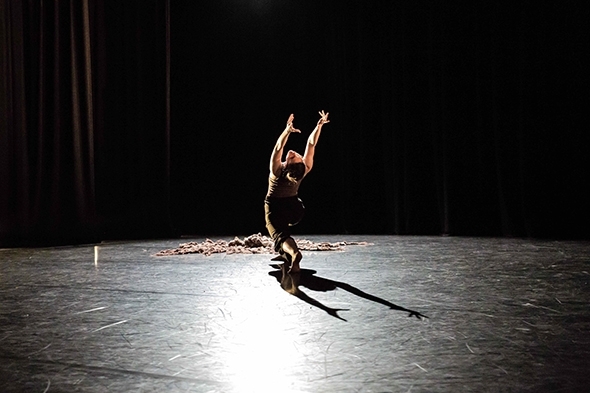 in February 2014 in a piece called Lapse, co-created with Heather Stewart. Both Stewart and Cox seemed like pawns in a complex game of text and movement, so it was interesting to see Cox performing in her own right at Roehampton University’s Footprint Dance Festival. According to the program note, de/construct traces the patterns of growth found in natural landscapes; though the title has rational connotations, both the imagery and the music by Alog are decidedly organic. As the lights come up we see a small island of sinewy hemp rope and sacking (designed and made by Cherrie Lau) that envelops the kneeling Cox, fitted to her waist and trailing around her like a network of roots. It is not a heart that beats but hands that quiver as she grows slowly out of this material; her body takes on its distinctness, its edges clearly defined. She sloughs off the skin to revel in the space around her but Cox does not take this separation for granted; she looks back at it in breathless moments of stillness, drawn up to her full and immaculate balance. When she begins to move, the agency of her movement is neither inside nor outside her; she simply elongates and stretches her sinuous, smooth gestures around herself in circular patterns that have no end. Watching her is like hearing fragments of speech in the wind, but they are fragments of speech in another language, eerily incomprehensible yet fully formed and complete. She lowers herself to the ground, silently. More quivering hands and smooth, sweeping diagonal gestures across her body, like a conversation with the air, her face intently listening, her body somewhere between birth and independence in the natural world. de/construct is but a fragment but for a moment all social constructs, all structures of human life, dissolve. de/construct was the last of eight varied works on the final evening at Roehampton’s Footprint Dance Festival, about which more later.